Learn how to use your Wi-Fi infrastructure to unlock actionable insights and business data in your physical spaces, playing on TechWiseTV. TechWiseTV workshop: Learn what Cisco Stealthwatch Cloud can do to close the visibility gap in Kubernetes. Learn how you can easily visualize and manage your entire distributed data and landscape. Playing now on TechWiseTV. Software updates with no disruption, advanced threat detection, and the freedom to deploy anywhere you want. Learn about the new Cisco Catalyst 9800 Wireless Controller on TechWiseTV. See how Stealthwatch Cloud detects threats across multicloud and hybrid networks. Lower-end access switch extends intent-based networking to everyone. See how FlashStack converged infrastructure simplifies the data center. Learn the tools and mindset it takes to bring NetDevOps to your organization. Learn how to program your intent-based network with Cisco DNA Center Platform. Cisco DNA Center opens up capabilities, workloads, and functionality to developers, partners, and customers. Capitalize on the adaptability of Cisco ML computing solutions to power the full AI data lifecycle, enabling organizations to extract more intelligence from data and make better decisions. Join Robb and his guests as they focus on the 4th gen Cisco ASR 9000, the “Swiss Army knife” of routers. Software-defined simplicity and visibility, now on the world’s most reliable enterprise routers. Your WLAN can now monitor and fix itself, thanks to analytics and automation. Security and business agility are top priorities. With the new Cisco Identity Services Engine, they’re no longer competing ones. Flexible new software consumption model for Cisco enterprise routers. Build policy once. Extend it to IoT endpoints. Replicate to distributed campus sites and connected things. Find out how to get greater returns from your Wi-Fi network. Learn how to scale up your campus network 6-fold without recabling. Learn how to manage data security holistically across multiple private and public clouds. Join this special TechWiseTV with live Q&A. Achieve multicloud speed and simplicity with hyperconverged platform innovations. Get control of disparate asset and sensor data to convert real-time analytics into data-fueled insights. Speedy wireless troubleshooting using new details from the client device perspective. Focus on building and running your multicloud apps. Not on the underlying complexities. Now you have more data sources with context for making sense of it all. See how Cisco DNA Center updates can help you. Run network devices on your laptop and test configurations before they hit your production network. See how Fast lane gives iOS apps priority on Cisco networks. Find out how easy it is to embrace intent-based networking and other benefits of subscription-based software licensing for access. Identify encrypted malware and ensure cryptographic compliance without decryption. TechWiseTV roams the show floor to show you the future of secure, hassle-free Wi-Fi roaming. Don't let overwhelmed operations and gaps in key IT talent put your digital dreams at risk. Join TechWiseTV live and learn the innovations behind Cisco’s new intent-based data center. See the new Cisco UCS M5 C-Series Rack Servers and B-Series Blade Servers. See what the future of programmable networks looks like. TechWiseTV covers the new policy-based automation solution that promises to revolutionize enterprise networking. Get a close-up look at the architecture, technology, and terminology that’s redefining simple. Learn why flexible silicon is the future of software-defined networking. See the new programmable capabilities in Cisco Catalyst switches that will change your life. TechWiseTV Live: More Apps, More Simplicity, The New HyperFlex. The benefits of Cisco engineered hyperconvergence. What more than 1100 customers already know. See how the Cisco Digital Building Switch is powering the smart lighting revolution. See how network engineers and developers are collaborating their way to coding success on Cisco. Join our pros and see how to get the visibility and protection you need across your entire network. See how Apple and Cisco work together to create the very best voice and app experience on corporate networks. See what’s new and what’s possible in the world of indoor position tracking. Join our experts now and discover today’s best options for keeping the edges of your network protected. See how to get unprecedented insight into applications within your entire data center. See how to manage any application in any cloud, all from a single platform. See how to protect your users and your data, on and off the network, with the latest security solutions. Simplify explicit path control and speed traffic delivery in your data center. See how to make policy changes easily without reconfiguring your network. See how new updates combine superior visibility with advanced protection. See how Cisco’s newest high-speed access points can take your enterprise Wi-Fi even further. Join our experts and see just how transformative a software-driven approach to IT can be in your organization. Explore the primary technologies that make up the innovative, service-centric Cisco approach to networking. From hardware to software to management, see the security solution that puts threat defense first. See what happens when your network-powered smart lighting, HVAC, and security converge on an IP network. Discover the secrets to building your own highly scalable, multitenant data center. See why Linux-based NX-OS is the answer to unlocking network automation and flexibility in your data center. See how you can save hundreds of hours by applying the DevOps practices to the automation of your network. Transform your raw data into operational intelligence with the right platform. See how object models running on your Cisco Nexus switches can help automate your network. Service providers: Join us and see the difference smarter routing can make for your business. See how to program and automate your network switches with the latest Cisco NX–OS. Learn how to design and test even the toughest network configurations right from your desktop. Get the visibility and control you need to stop malware dead in its tracks. Service providers: deploy virtualized services for customers of all sizes. See how you can deliver new services to customers more quickly than ever. Discover the valuable lessons we learned building a world–class data center. 802.11ac Wave 2: Are you Ready? Find out how to deliver unprecedented speed though your existing cables. See how the Cisco Technical Assistance Center redefines service after the sale with engineer–level support for Cisco customers. Use FlashStack to deploy workloads securely across multiple data centers and clouds. Learn about three tools from Cisco that you can begin to use today in your NetDevOps journey. Join us as we go over the brand new Cisco DNA Center Platform and show you how to start integrating and developing your own applications on Cisco DNA Center. Learn how to scale artificial intelligence with the new Cisco UCS C480 ML Server. Learn how to add incredible compute density without the complexity. Explore the details of our new flexible, outcome-based consumption model. With the Cisco SD-WAN software now available on the ISR 1000 series, ISR 4000 series, ASR 1000 series and ENCS 5000, Cisco is bringing together the leading routing platform with best in-class SD-WAN. Cisco experts walk you through the exciting features and benefits. Learn how to use Catalyst 9500 switches to improve network scale and boost access and core speeds with no rip and replace required. Learn how to use Cisco Identity Services Engine (ISE) to drive business agility while obliterating malware and data breaches. Learn how to automate WLAN troubleshooting. Learn how to extend software-defined simplicity and agility to IoT devices. Develop in the cloud and deploy anywhere. Learn more about the underlying technologies in the Cisco Hybrid Cloud Platform for Google Cloud, a single software solution that lets you treat the public cloud as an extension of your on-premises environment. Learn how HyperFlex powers any app with the simplicity of hyperconvergence. Unify your threat detection in on-premises and cloud environments. Protect your data wherever it flows. Learn how to turn up your network sensors and translate all that data into faster, better IT decisions. Learn how to make better decisions, automate workflows, and gain end-to-end visibility into your heterogeneous operations environment. Learn the ins and outs of Cisco Container Platform and simplify life for you and your developers. Learn how to obliterate those IT skills gaps and accelerate your digital transformation by using Cisco Services. Learn how to unlock the value hiding in your technology investments and innovate at the speed required to compete and win in today's digital business. Learn how Ansible, Vagrant and other developer tools bring DevOps culture to networking. Learn how to prioritize and validate iOS apps without expensive test beds. Detect malicious traffic without decryption with Cisco’s Encrypted Traffic Analysis Solution. See how you can detect malicious activity in encrypted traffic by activating your Cisco infrastructure to mitigate threats faster than ever before. Don't settle for a run of the mill server. Get a unified computing system. Join us for a deeper dive into the fifth generation of Cisco UCS. It's not a server. It's a system. Does hardware still matter in the age of Software and Virtualization? It sure does. Come to this webcast and learn why Cisco’s flexible hardware is key to enabling network evolution. Programmability features like NETCONF/YANG, Python, and on-box application hosting enable greater flexibility and fast configuration of Catalyst switches. Join the webcast and learn how to take advantage of these exciting new tools for Catalyst switches. Introducing Software-Defined Access (SDA), a revolutionary, next generation architecture for optimizing, managing, and administering your network. Join the webcast to learn how you can upgrade, simplify, and improve your network’s performance using SDA. It began with the Catalyst 6500 as the foundation of enterprise WAN architecture. Now, it’s back to the future. Cisco introduces the new era of networking with the release of the Catalyst 9000 Family of switches. Learn how Cisco is powering the next generation of automation, management, and security for IoT smart buildings. Join us to see the latest projects from the Cisco DevNet engineers using NX-OS, Cisco UCS Manager, Meraki, and Cisco Spark. Learn how you can use DevNet resources such as the DevNet Sandbox and Learning labs to build your own projects. Join our workshop to see how Apple and Cisco work together to fast-track the mobile enterprise, changing the way work gets done today. Hear how we can help optimize Wi-Fi connectivity and let you easily prioritize business-critical apps over the air. To learn how you can build policy using Cisco Identity Services Engine (ISE) and Cisco StealthWatch to get full visibility, control network access, and contain threats at scale, join this webcast. Indoor accuracy with BLE or Wi-Fi—your preference for your preferred use cases. Learn how you can make the most of both technologies to power more effective business decisions and more impactful engagement for your customers. 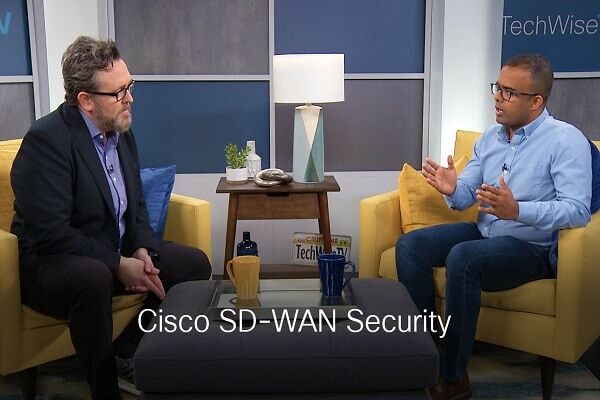 Join TechWiseTV and Cisco experts as they discuss using machine-learning sensors, packet capture, and network-based application recognition for faster incident response and device-level mitigation at the branch. There’s never been an analytics platform like this. Get an exclusive look at Cisco Tetration Analytics, a platform designed to provide pervasive visibility and behavior-based application insight that enables you to get to a secure zero-trust model. Join this in-depth look and detailed demonstration of the OpenDNS Umbrella integration with AnyConnect and how it really can stop most threats before they become serious problems, protecting users anywhere they go, even when the VPN is off. Managing multiple applications across hybrid cloud can be complicated unless you are using Cisco CloudCenter (CliQr). Join us for a deep-dive conversation and demo. Optimize applications with increased network intelligence and adaptability using segment routing for the data center. See how the latest evolution of Cisco TrustSec helps protect critical assets by extending and enforcing policies anywhere in your network. Go in-depth with how Cisco TrustSec simplifies your network security with software-defined segmentation. "Seeing better" and "protecting better" lie at the heart of what’s new inside ISE 2.1. Join this in-depth look and detailed demonstration of the ways ISE 2.1 reduces time to detection and resolution of even the toughest network threats. Discover the broad Cisco portfolio of access point devices that support the latest Wi-Fi standard, 802.11ac Wave 2, and how it is increasing bandwidth for more devices. Innovations beyond 802.11ac Wave 2 plus real-world use cases will be reviewed. Enterprise Network Functions Virtualization is no longer just for service providers. Join our next live workshop as we go under the hood of Enterprise NFV—a purpose-built, complete solution for the enterprise. Virtual benefits, better reality. Join our experts for this online workshop to see up close and personal the industry’s first fully integrated, threat-focused next-generation firewall, which keeps customers safer, mitigates advanced threats more quickly, and simplifies operations better. The latest technology revolution is happening right above your head, and Cisco's Digital Ceiling is leading the way by accelerating the digital transformation and extending the benefits of IoT across organizations. Join this workshop and discover how VXLAN becomes an overlay network where scalable multitenancy is solved with the BGP EVPN control-plane. Are you challenged with responding quickly to business needs? Do you spend too much time configuring and maintaining your network? Tune in to learn how you can spend more time delivering innovation to your business with open NX–OS. Join this workshop to learn how you can accelerate time to insight with Splunk software and Cisco UCS integrated infrastructure for predictable, outstanding performance. Discover how to create a programmable network as we demonstrate the NX–API and NX–API REST (Object Model). Understand how Cisco Open NX–OS extensibility exposes greater programmability and automation capabilities that eliminate costly manual errors. Building physical networks can be a time-consuming, painful, and repetitive task. In this live online demonstration, we will look at how you can simplify the building of labs using network virtualization. You need endpoint protection and the best threat intelligence to defend against today's advanced attacks. Learn how Cisco AMP for Endpoints and AMP Threat Grid give you the visibility and control to rapidly detect, analyze, and remediate malware. Join the webcast to learn how you can use the Cisco switches to prepare for superfast wireless offerings (up to 6.8 Gbps) without replacing your existing cabling system. Join TechWiseTV's Jimmy Ray Purser and the Cisco Technical Assistance Center (TAC) Security Show Podcast team for this in–depth training session to get the most out of your own experience with the TAC. Miercom provides a comparative assessment of branch office routers between Cisco, Huawei and Hewlett Packard Enterprise. HyperFlex Rockumentary: The story behind the song explains the story behind the legal bytes band and their song Cisco HyperFlex is here. The band is made up of CIOs int he legal industry and their song was inspired by Cisco HyperFlex. Assure network security policies and check for compliance against business rules to reduce security risk and achieve provable continuous compliance by policy and state. Stop threats now. Your network can be a powerful security enabler through segmentation and visibility. Learn how. Considerations for deploying an SMB network for beginners. Considerations for building your own small office network. Build a digital-ready network with switches designed for security, mobility, IoT and the cloud with the Catalyst 9000 family. Learn more. Network data volumes are growing exponentially, how will you make sense of your data? Cisco DNA equips you with powerful insights. Meet the Cisco Catalyst 9000 switches, capable of detecting threats in encrypted traffic without impacting performance. Learn how. Maximize uptime and make network updates without disruptive downtime. See how Miercom tests verify it can be done with Cisco DNA. Simplifying network operations is attainable. Miercom tests verify Cisco DNA helps automate your network and improve performance. What you need to keep in mind when choosing your next network switch. What you need to keep in mind when choosing and deploying your wireless networks. See how decoupling network functions from specific hardware can help you achieve much greater agility. See how Cisco incorporates the latest NBASE-T technology into its solutions so you can get speeds of up to 5Gbps over your existing Cat5e and Cat6 investments. Wireless protocols are changing fast. Wave 2 of 802.11ac promises more than previous generations. Learn about the upgrades and what they mean for your strategy. Services for the Cisco Integrated Services Router are now even more powerful. Learn just how much power and flexibility is now available to your network with Service Containers. Learn how to address the threats faced by today's networks on what many describe as the most vexing portion of the security industry. Learn about a cost–effective solution for 40–Gigabit connectivity with zero–cost fiber migration. See how the latest Cisco solutions help tackle the five trickiest challenges facing today's high–density client environments. Learn how Cisco Catalyst Instant Access technology can improve performance in your network. Watch this entertaining look at the convergence of wired and wireless and never look at your network the same way again. Learn how NGE can help you meet the security requirements of the next decade and work with new products that use NGE to meet scalability requirements. Learn how to save money, reduce complexity and extend collaboration across your network. Cisco's VSS is a clustering technology that turns two physical 6500 chassis into a single logically managed powerhouse of redundancy. Learn how the Cisco Nexus 1000V InterCloud framework offers a strategy for the enterprise cloud journey. Sing along and learn how LISP can separate location and identity, making it easier to move data. Learn about this system of technologies designed to accelerate applications and free up wasted bandwidth without modification to your environment. Get real-time contextual information for proactive governance and policy through identity across every network device. See how AppNav reduces operational complexity by virtualizing WAN optimization resources. Robb Boyd guides you through the technical differences that make VXLAN a smarter, more scalable choice in your enterprise than the traditional VLAN. Learn just what makes the Cisco Business Edition 6000 the ideal choice when migrating from analog, digital, or hybrid-PBX phone systems. The benefits of hosted cloud services can now be extended to the enterprise WAN. Watch for an entertaining look at this cloud intelligent technology. Learn how virtual workspaces deliver the uncompromised user experience. Learn why virtualizing your Unified Communications is a worthy endeavor with many benefits and important considerations to understand. Get the foundation for understanding what makes end to end path isolation so valuable. Watch and learn - then decide if you want to pursue further. This short video in the Fundamentals series seeks to level the playing field and establish the right metrics for today's high end firewalls. Learn how Cisco TrustSec helps you secure borderless networks with confidence, consistency, and efficiency. Learn the fundamentals of Overlay Transport Virtualization (OTV), and discover the benefits of layer 2 connectivity between data centers. Learn how the Mobility Services Engine supercharged CleanAir with real-time intelligence. Get the truth behind 4x4 radios and the reality of spatial streams for the 802.11n Wi-Fi standard. This latest Fundamentals episode from your friends at TechWiseTV dives into latency, traffic management, and your scalability options. This video explores the technology, deployment, protocols, and more, of controller-based design. This may be the kick start you need to getting on board with making the move from a traditional telephone switch or PBX to an IP Telephony system.